From page 1 of the breifing note. 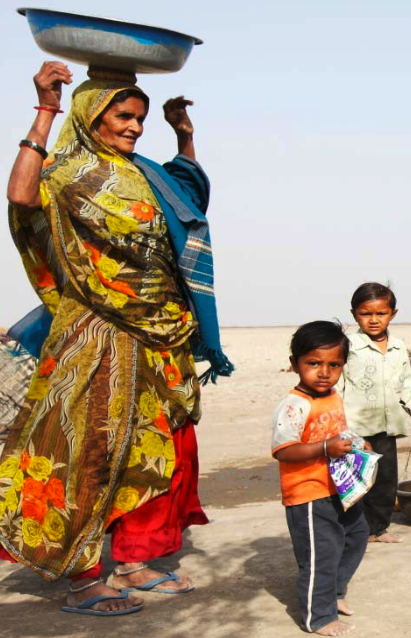 Communities in India are increasingly feeling the effects of drought and water shortages. Billions of dollars are expected to be channelled toward climate change action in the Asia-Pacific region from domestic and international public and private sources. Managing this financing can prove a challenge if countries lack the strategies and systems to obtain and implement funds effectively. Many countries have already started to employ a combination of various mechanisms to manage climate finance. Governments from across the region have identified capacity development activities to help them put in place appropriate institutional and financial mechanisms to access available climate change funds. With appropriate mechanisms in place, governments are then better able to demonstrate to national and international decision makers their capacity to receive and utilize climate finance effectively. This briefing note provides an overview of the principal activities undertaken and the key outcomes. NCFs are country-owned funds that can access and manage finance from a variety of domestic and international sources and deliver them to support climate actions of national priority. In 2012, ADAPT Asia-Pacific supported a Regional Clinic on the Design and Management of National Climate Funds that brought together fund managers from well established as well as recently established funds. Representatives from countries considering establishing NCFs were also invited. This Regional Clinic was the first of its kind globally. At the meeting, the design and management of NCFs was discussed. Fund managers shared their experiences of establishing and managing national funds for environment and climate change with those who had less experience. Upon return to their respective countries, participants have continued to share information they gained from their peers during the Regional Clinic. This includes the advantages and disadvantages of an NCF, possible design features of NCFs, identifying opportunities for future collaborative work and peer-support between participating countries. A report was produced to highlight the lessons learned from the establishment and administration of NCFs in the region. ADAPT Asia-Pacific supported UNDP and other partners in delivering a regional workshop on Climate Public Expenditure and Institutional Reviews entitled Past Experience and the Way Forward in September 2012. Regional officials from Ministries of Finance, Planning and Environment, as well as representatives from civil society, parliamentarians and donors participated to discuss (i) past experience and lessons learned from CPEIR; (ii) a review of CPEIR methodology; (iii) recommendations for collaborative work and peer support; and (iv) next steps at national, regional and global levels. While international sources of climate funds have been the topic of much discussion and debate, national domestic sources will likely constitute the large majority of climate change adaptation financing in the future. Preparation of national climate change public expenditure and institutional reviews (CPEIRs) in Bangladesh, Cambodia, Nepal, Samoa and Thailand supported by UNDP, the World Bank and other donors has begun to reveal information on the allocation and management of the domestic (and external) resources that are being used to fund climate change adaptation and help these countries along the road in developing a climate fiscal framework. The results of ADAPT Asia-Pacific support to date have included heightened awareness and understanding among government officials about the mechanisms and tools available to them in attracting and managing climate change adaptation finance. Future support may build on this effort, contributing to the establishment of government processes which enhance the flow of funds to effective adaptation programs in selected countries. USAID Adapt Asia-Pacific (2012) Supporting National Climate Funds and Climate Public Expenditure and Institutional Review in Asia-Pacific. Briefing Note. USAID Regional Development Mission for Asia: Bangkok, Thailand.